If you're settling the deceased's estate or planning their funeral, you'll need to request several official copies of this government-issued document. There are three basic ways to obtain copies of a death certificate in the U.S., and procedures vary by state. Contacting the county or state health department where the person died. Proving that you are a relative or legal representative of the deceased's estate. Paying the certificate and copy fees by check or money order. If your state is unable to find the death certificate you are requesting, they will send you a Certificate of Failure to Find, also called a Certificate of No Public Record or a No Record Statement to prove you've attempted to locate the document. If you are working with a funeral home to plan current burial or cremation arrangements, they can request copies of the death certificate for you. Funeral directors are often the ones to file the death certificate, within 72 hours of the death, so they're accustomed to handling them. This service is often included in the fees you pay to the funeral home, but in some cases may require an additional fee per copy. Simply tell the funeral director you'd like them to order the copies and tell them how many you need. 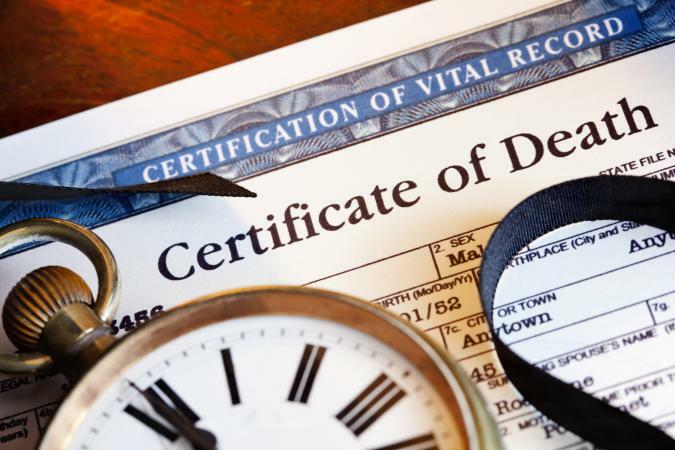 If you're looking for copies of a death certificate from the past, funeral directors may be able to provide information on how you can obtain the documents, but probably won't be able to request them for you. Companies like VitalChek, which are also used by the government, can get you copies in most states. The only states they don't service are Vermont and Wyoming. In addition to death certificates, VitalChek can also help you retrieve other certified government documents like birth certificates and marriage records. If you need copies of a few different official documents, using a company like this can help you get them all at once. The entire ordering process takes about ten minutes if you've got all your personal and mailing information handy. Start by clicking on the "Place An Order" tab near the top center of VitalChek's homepage. Then select "Death Certificate" from the next screen. Choose the state where the deceased died from the map then hit "Continue." Next select your city or town from the drop-down menu and hit "Continue." You will then be prompted to enter personal information such as the date of death. Make your payment and submit your order. Orders are typically received withing a week or so. You'll pay the actual cost of the copy as set by the issuing government agency, a processing fee up to 16 dollars, and a low shipping cost to receive your documents. From VitalChek's homepage, click on the "Pricing Info" tab and enter your state to see how much each copy costs. You'll need copies of a death certificate to access any benefit claims, finalize funeral planning services, and settle the deceased's administrative affairs. Talk with your funeral director or local health department to find out how you can obtain copies in your state.